Get those flickin’ fingers warmed up, because Pixelocity Software has just announced that they will be releasing Disc Drivin’ 2 on the App Store next Thursday, February 1st. First launched in December 2010, the original Disc Drivin’ took the App Store by storm, making a huge splash and capturing the attention of many a mobile gamer. 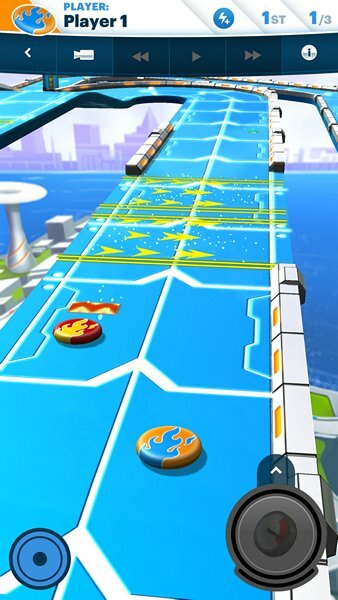 Inspired by the dexterity board game PitchCar, this excellent digital implementation offered asynchronous play and special power-ups (not feasible in a physical game) and quickly became a staple on my iPod Touch/iPhone for years; I constantly had as many as 10 asynchronous online games going at once. If you are somehow missed the Disc Drivin’ phenomenon, it is a racing game in which players take turns flicking their disc around a variety of race tracks, vying to be the first to complete a specified number of laps. Players have to be careful not to accidentally flick themselves off the track and must strategically use boosts, bombs and risky shortcuts to get ahead and finish first. Now, just a little over 7 years later (and quite a while since we’ve heard from Pixelocity Software), this frenetic and fun iOS classic is about to get a proper reboot/sequel with Disc Drivin’ 2. While the core gameplay remains the same, aside from the expected, usual graphical and physics engine improvements, Pixelocity has added some rather cool sounding tweaks to improve the gameplay, change up well-used strategies and give the game even more replayability. For instance, now players have two swipes per turn (instead of one), allowing them to first set up their shot and then make a second swipe while their disc is in motion in order to get better positioning or perhaps avoid an unexpected hazard. New spline-based tracks allow even more crazy twists and turns as well as elevation changes which racers must take into consideration. Disc Drivin’ 2 will also feature a new card system which implements upgradeable powers and disc abilities (turbo, missiles, autopilot, and bombs) which players can use strategically use both defensively as well as offensively. By collecting these cards, players will “unlock crazy new discs, upgrade powers, and earn disc abilities”. Driving routes will be a bit more challenging and treacherous in the sequel, giving players more things to worry about than just their opponents or gaps in the safety railings along the course. 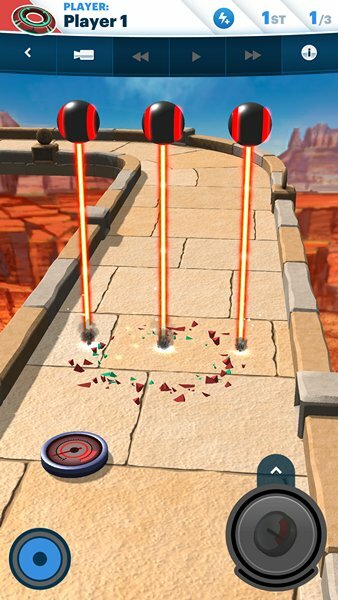 Disc Drivin’ 2 features more than 15 unique new tracks which add new animated hazards like lasers, spikes, and force fields. Like the original, the sequel will once again offer the ever-popular, turn-based online multiplayer battles. There will also be single-player Speedrun and local multiplayer, pass and play options as well. And to show off your individuality, you’ll have even more silly ways to customize your disc, with the option of playing as a pizza, cake, monster truck tire, and more. 2018 is already turning out to be an excellent year for iOS classic sequels with Hero Academy 2 launching last week and Disc Drivin’ 2 next week. The game will be free-to play, right now it’s unclear exactly how it’ll be monetized or what the in-game economy will be for new cards, disc customization items, etc. All I’ve seen is a few screenshots this far, but the game looks gorgeous and I can’t wait to check out of rehab and revive my Disc Drivin’ addiction with this worthy looking sequel. Look for more info and thoughts from me on Disc Drivin’ 2 after it launches on Thursday, February 1st.